Pittsburgh Restaurant Week started this past Monday. A week of special dining deals at 50+ restaurants. But... we didn't get to our first restaurant until Thursday evening. And it is a place we have dined at many times before, one of our favorite places: Bistro 19 in Mt. Lebanon. I happen to love the cozy, dimly lit interior, especially when we have a seat near the huge windows and we can watch the people and traffic out on Route 19. Our reservations were for 7:30 pm and we were seated right away. It was busy, but not as busy as some of our past visits, which are almost always a Saturday evening. We went because of the PRW menu we had seen posted. This means that I didn't even open the regular menu. I was not going to look at the Black Tiger Shrimp on the menu. I was not going to read the description - stuffed with artichoke & spinach deliciousness, nestled atop a bed of creamy risotto, a creamy tomato parmesan sauce, wilted spinach. I was going to finally try something other than the Black Tiger Shrimp. 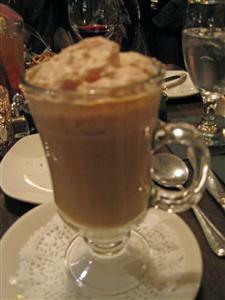 Pumpkin Cappuccino Bisque. Served in a cappuccino glass! I had a small taste. Lots of pumpkin and cinnamon flavors but with a definite coffee taste in the background, making you want to keep spooning bites into your mouth. Just enough coffee taste that it didn't taste like liquid pumpkin pie filling, but not so much coffee taste that it was like drinking a pumpkin spice latte. For his second course, SP chose the Coffee rubbed mahi mahi with yucca purée, coconut rice, and candied kumquats. He said the candied kumquats were delicious, the fish was nicely cooked with just enough of the rub that it wasn't overpowering, and he ate everything on his plate. It wasn't too surprising that I chose the Roasted Lamb Gnocchi with roasted root vegetables and sage butter. I love when I order gnocchi and they taste yummy not gummy or like very heavy blobs that are mushy and tasteless and will sit in my stomach like a ton of bricks. These were so good, they kind of melted in my mouth, if that's even possible for gnocchi. The lamb was so tender and flavorful, delicious roasted veggies. I, too, cleaned my plate, sharing a few bites with SP. Third course was dessert. SP loves rice pudding, so I knew he would select the Butterscotch Rice Pudding. He said it was rich and delicious. I didn't try any. In my world, rice does not equal dessert. Ever. Not even if mixed with chocolate. I don't think I had ever tried panna cotta before. I have tried flan, which I always figured was the same as panna cotta, but a quick search today revealed that panna cotta is gelatin based while flan is egg based. This had a very nice coffee flavor and was so creamy and soft and delicious. I was a bit skeptical of blueberries with coffee, but it worked. There was an optional wine pairing for the PRW menu, and I chose to try it. I shared the 3 wines with SP - I didn't want a glass of wine, but small tastes/pairings with each course and shared with SP was just the right amount for me. The first course was paired with a Pinot Noir, the second was also a red but I forget what kind, and the dessert pairing was a port. I don't like port, so I let SP drink it! Port is always too strong for me, or maybe I should say too concentrated? It makes me shudder, even when I just put the tip of my tongue in it for a wee taste! As usual, we really enjoyed our food and the service was terrific.Still one of our favorite places, plus, we don' have to drive into the city, which is nice because sometimes we just don't want to deal with the Parkway West! 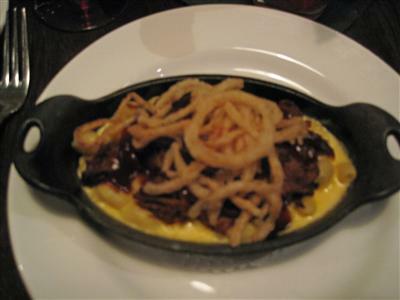 There are 3 more days of PRW and if you are looking for a place to try, I suggest Bistro 19.